Domenico Cimarosa was born in Aversa, a major agricultural town between Naples and Caserta, in 1749. He came from a humble family: his father was a bricklayer who died early in his life due to an accident at work on the scaffolding of the Royal Palace of Capodimonte, which dominates the center of Naples. Young Domenico was then taken in by the conservatory of Santa Maria di Loreto, one of the many Neapolitan institutions that combined musical education and social assistance. Here he became a skillful harpsichordist and violinist as well as a respected singer. In the middle of the eighteenth century Naples was the largest city in Italy, with nearly half a million inhabitants. It was one of the leading European centers of musical production, its composers travelled all over the continent and the unique style of their melodramas was the point of reference for the musicians of the era. Naples was also home to a prestigious university, where ideas circulated, spread by the French encyclopédistes, about social progress through education and widespread economic freedom. The principles of equality and freedom that led to the French Revolution had begun to take root. From his debut in the opera buffa at the popular Teatro dei Fiorentini in 1772, Cimarosa went on to have an extraordinary career that gained him a prominent place in the programs of the theaters in Rome, Milan and then Vienna and Dresden, which were the main venues for Italian opera in Europe. 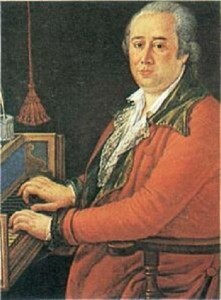 Compared to other Neapolitan composers whose works were performed throughout Europe, Cimarosa had the gift of a particularly rich and varied melodic invention. On a very simple harmony, he developed very long melodic phrases often with a gentle chromatic speckling. The most beautiful melodies that the human soul has ever conceived, according to Stendhal. The few times where the voice is not the protagonist, often the oboe emerges, the instrument that shines through the orchestra with its brightness and clarity. Cimarosa dedicated a concert with orchestra to the oboe as a soloist. The primary role of the melody is married with a strong tearful atmosphere, with so many innocent maidens in distress, brought to the brink of despair before the inevitable happy ending. His greatest success was for a long time L’italiana in Londra, a story that united the spirit of romance, very comical characters and the thrill of the risks taken by the protagonist. More than a comic opera it is a piéce à sauvetage, which later will be called opera semiseria. These story lines distinguished Cimarosa from his peers and also from the famous Giovanni Paisiello (born in 1740) who preferred the scathing satire of a perfunctory nobility and intellectuals stuck in their dusty erudition. It is, of course, an approximate distinction, not more than indication of preference, since there was no shortage of mutual influences and emulations, close to the limits of plagiarism. Thus, as in Paisiello pathos was not lacking (for example in his Nina pazza per amore, 1789), Cimarosa did not mind satire, although he was a bit more good-natured than his colleague. Il ritorno di Don Calandrino (1778) is the story of a wayward young man who returns to the village from the city trying to hide the fact that he has lived for years without doing anything and has lost through gambling what his father had given him for his university studies. And there is no shortage even of theatrical satire with L’impresario in angustie (1786), which Goethe liked so much and translated for the Weimar theater (Die theatralischen Abenteuer, 1791). L’italiana in Londra (1779). Livia, under a false name, goes from Genoa to London in search of her beloved, Milord Arespingh who had left her because his father has decided that he should be married to an English noblewoman. At the inn where she is staying, she meets Sumers, a Dutch merchant, Don Polidoro, a Neapolitan, and the beloved Milord. The meeting between the two creates some misunderstandings and tensions: Milord does not recognize her and Livia does not know that he still loves her: she thinks he has abandoned her. Meanwhile, the father of Milord, knowing that she is staying in London, has ordered her arrest: Milord intervenes, and, after many adventures, the marriage between the two lovers happily ends the opera. The 1780s were the golden period: also in demand was the opera seria (L’Olimpiade, from the libretto by Metastasio, inaugurated the Eretenio Theatre of Vicenza in 1784 ), a series of successes that continued for a long time in the theaters of Europe: Giannina e Bernardone (1781), I due baroni di Rocca Azzurra (1783), Il fanatico burlato (1787), which found a way of combining satire with elements of adventure and pathos. Il fanatico burlato (1787), is a satire about the madness of nobility, where Don Fabrizio, baron of Cocomero, is searching for a husband for his daughter Doristella that will enable her to advance herself in society. He ends up falling victim of a hoax in which a fake Turkish prince offers to appoint him « Great Mammalucco. » But in the meantime Doristella flees and gets lost in the woods with her young lover Lindoro and faces fear and desperation. In 1787 came the invitation to the court of Catherine the Great. Cimarosa was thus following the path of so many Italian musicians before him: Locatelli, Manfredini, Traetta, Paisiello and Sarti. 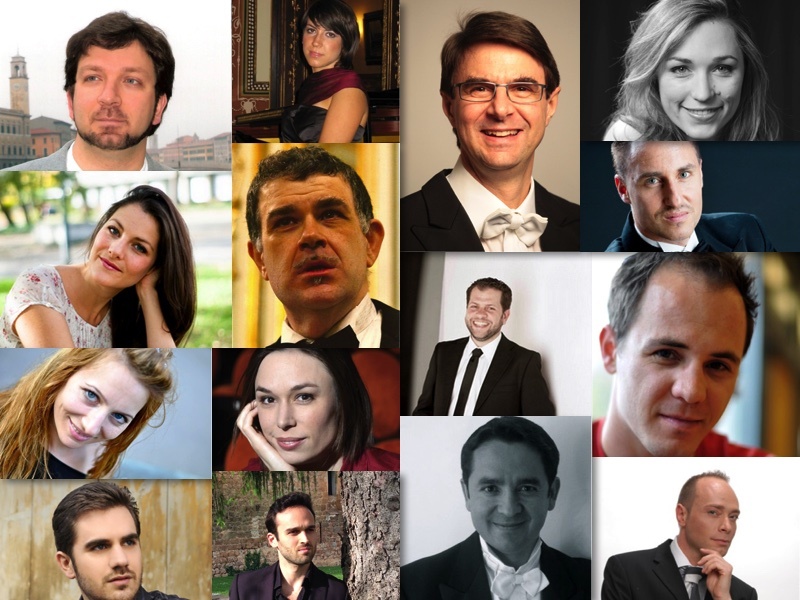 A long journey, a true Grand Tour of Neapolitan music from Venice to Vienna, then to Prague and Warsaw (with a possible detour to Dresden), and finally St. Petersburg. In each of these cities the stop-over could last a few months and composers would leave their mark and get themselves known. Cimarosa set off with his whole repertoire, thus in St. Petersburg all his successful works were performed, including I due baroni. The Empress Catherine of Russia was engaged in serious cultural upgrade of a marginal court. This was clearly a matter of international prestige, given that her colleagues in Berlin, Frederick, and from Vienna, Joseph, used to get up before dawn to study flute and harpsichord and discussed music on a par with Bach and Gluck! This cultural commitment completed the building, led by Italian architects, of the great capital on the banks of the Neva, while the Russian translation of Montesquieu’s principles on the separation of powers, while the translation of the booklet by Cesare Beccaria against the death penalty announced reforms led by the authorities. The intentions remained almost all on paper, but for the moment this was just a minor detail. Returning from Russia having made a good sum of money, Cimarosa passed through Vienna again, where he arrived in December 1791, a few days after the death of Mozart. The reception was triumphant, and the Emperor Leopold II appointed him maestro di cappella and put him in touch with the new court poet, Bertati, who offered him the libretto of the Matrimonio Segreto. It was his greatest success, the only work that at the first performance (at the Burgtheater on February 7, 1792) was repeated entirely at the request of the court. Il Matrimonio Segreto is celebrated by Goethe and Stendhal, and Rossini himself acknowledged it as the starting point of his theatrical adventure. The Matrimonio has the irresistible charm of a perfect comic machine, interrupted for a moment by the extraordinary scene of despair of Carolina falsely accused by all the family. A page of divins accents for which Julien, the protagonist of Le rouge and noir by Stendhal, was unable to hold back his tears. Cimarosa returned to Naples in 1793. 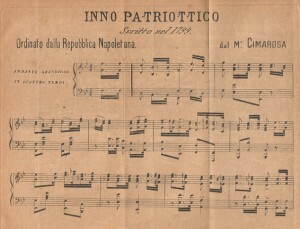 It was the time of his last successes in the buffo genre (Le astuzie femminili, 1794),as well as a grand French-inspired opera seria in the structure and ideas of the republican virtues that he wanted to transmit: Gli Orazi e Curiazi (1796). In the same years, the artist Jacques Louis David painted his famous piece on the same subject which can be seen in the Louvre. 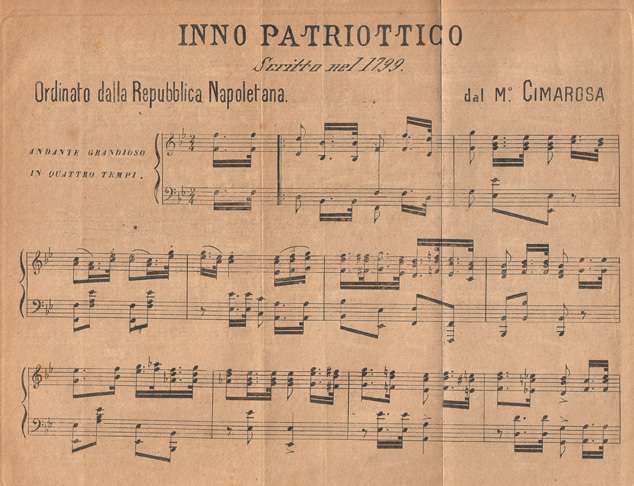 We know nothing of the political ideas of the composer, but there are many signs of his involvement in the Neapolitan Revolution of 1799, especially a patriotic anthem performed in front of large crowds on 30 Floréal 1799 (i.e. 19 May) Per l’abbruciamento delle immagini dei tiranni (To burn out the tyrants’ images). The failure of the Parthenopean Republic and the return of the Bourbons hit the musical world and signaled the end of Naples as the cultural capital: many young students from Neapolitan conservatories who had supported the Republican government had to flee. Paisiello, perhaps because he had been more prudent, or perhaps because of the friendships he had, was restored by King Ferdinand, but as soon as he could he took refuge at the court of Bonaparte. The Neapolitan Revolution broke out in January 1799 in the wake of the French successes in the first Italian campaign. The Republic, supported by the Jacobins and the bourgeoisie, but also by many nobles, was modeled on the French Republic of 1793. Just five months later, when the French army had to retreat as a result of the advance of the Austro- Russians in northern Italy, the Republic was overwhelmed by the British army, but above all by the ferocious popular bands of the « partisans of the holy faith » led by Cardinal Ruffo. The repression was terrible: the bourgeoisie, intellectuals and the aristocrats involved, men and women, were decimated. The British fleet under Admiral Nelson, at anchor in the Bay of Naples, prevented the Republicans from escaping and delivered them back to Bourbon justice. Ferdinand IV de Bourbon was King of Naples from 1759. He had inherited from his father Charles III the politics of « enlightened absolutism. » While not hindering the development of arts and culture and the dissemination of French ideas, he always denied any reform in the management of power or oppressive feudal system in which his kingdom was organized. Queen Maria Carolina of Habsburg, daughter of the Empress of Austria Maria Theresa and the sister of Marie Antoinette who ended up on the guillotine during the French Revolution, was one of the strictest supporters of the legitimists. Cimarosa was instead sentenced to death and remained in jail for four months. Thanks to the intervention of Cardinal Consalvi, the protagonist in the dialogue between Bonapartist France and the Church, the sentence was changed to exile. The musician never recovered from the shock and died at only 51 years old, in Venice in January 1801, as a guest of a noble Venetian family at the Duodo Palace in Campo Sant’Angelo. His sudden death gave birth to the legend, launched by Stendhal, officially denied but nevertheless to be found in the early biographies, that he was poisoned by his enemies and that Queen Maria Carolina may have been involved. Cimarosa is a complete master … I realized just how possible it is that nonsense, absurdity can be mixed in the happiest manner with the superior aesthetic quality of music. This simply comes from humour, which, without being itself poetic, is a kind of poetry that naturally lifts us above the subject. Two brides, two Egyptian fortune tellers, two magicians surrounded by ghosts who inhabit an old pavilion. The more the poor couple Demofonte and Totaro try to unravel the tangle, the further from the truth they are and even the mere hope of understanding something vanishes. When the deception reaches its climax, the two deceivers are revealed and the solution appears; thus, without a psychological reason or any real need, except for the fact that towards the end of the second act, and after an hour and a half of music, it is about time for the singers to rest and for the audience to go home. I Due Baroni di Rocca Azzurra is a geometric opera, organized into concentric circles, with three deceptions that accumulate in a crescendo of surprise and spectacle. It does not claim to be a realistic story, let alone to put men and women on stage and justify their actions and feelings. There is just a thin veil of social satire in these two barons who live isolated in their feud, a pretentious and ignorant uncle and a decidedly stupid nephew, caught at the beginning of the opera dreaming about being surrounded by their descendents, a bunch of little noble rascals who cry “Papa, papa”. The intervention of Franchetto with his false portrait is a conventional gimmick, nothing but an excuse to get the ball rolling. From this moment on the only thing that counts is the swirling mechanism that is set in motion. Here two women are in conflict. Firstly there is the commoner Sandra, bright and suitably lively, and comic mistress of fencing. She terrifies the poor Totaro, just to make it clear what terrible punishment awaits him if he dares to look at other women. Her music is always lively, rhythmically sharp, as befits a prima donna buffa. On the other hand, the noble Madame Laura is destined by her social class to a more noble and elaborate singing line, and thus to introduce a hint of tenderness into the show, if not melancholy, finally allowing herself a personal reflection on lost love. Her entry (Queste care aurette amiche), as if she were a bit�� surprised to find herself in the absurd world of Rocca Azzurra, interrupts for a moment the breakneck speed of the start of the story. This is a classic Cimarosiana melody, gently enveloping, crossed by a small thrill when she emphasizes the word ‘traitor’ with deceptive cadences. Cimarosa ‘s music has a strong rhythm of changes that leaves you breathless. An energetic vortex underlies the verbal short-circuit of Demofonte (With this I come to conclude that in general, women are physical, topical, critical, they are devils …), suddenly a little tremolo in the violins plays with the childish fears of the two barons confronted with the spells of the sorceress Alcina, then an oboe emits its bittersweet song about the disillusionment of Laura in the beautiful air with the rondo of the second act Il mio cor gli affetti miei. The game is based on the continuous exchange of energy between the stage and orchestra, with the complicity of the audience. Even feelings and promises of marriage do not seem like anything real, and can only be justified by the laws of theater. The movement is incessant, the energy released is very high, but all in a closed, self-contained system: no room for any kind of invasion by reality. Cimarosa offers the perfect realization of Schillerian beauty, in which the theatrical mechanism is resistant to external influences. We find ourselves at the same time in a state of deepest stillness and maximum movement, and where wonderful emotion originates for which the intellect has no definition, nor language a name. Total bliss, the perfect beauty! And there’s more. The two barons, the two women dragged into the deception, the same deceiver who loses control of his joke, have no will of their own, but are driven by events that prevent the influence and the use of reason. And, in the furious pace in which the orchestra engulfs them, musically they go insane. If we look at this theater with a post-romantic eye, for whom life is worth living if it’s an act of the will, there is the impression of empty nonsense. But if we look at it with the eye of a disillusioned man of the eighteenth century, who sees life as being tossed between random events in which only reason prevents man from going crazy – there is a message much closer to the disenchantment of the people of the twenty-first century- the closed system becomes a laboratory where disoriented man loses his identity. The composer makes the characters dance like cat and mouse, the audience watches amused at this loss. So the perfect bliss can suddenly be colored by troubling aspects, perhaps that Cimarosa himself had not even imagined. Or probably he avoided them, more attracted by the enchantment of the game. But Mozart took them onboard. What does Mozart have to do with I due baroni? On the evening of 6 September 1789 at the Burgtheater in Vienna I due baroni by Cimarosa was performed. Among the audience were certainly Wolfgang Amadeus Mozart and Lorenzo Da Ponte. The two, who after Le nozze di Figaro and Don Giovanni were writing Così fan tutte together, had at least two friends on the stage. The first friend, the bass singer Francesco Benucci was greatly respected by Mozart. Benucci had already sung his Figaro and Leporello, and in Così fan tutte the character of Guglielmo would subsequently be written for him. It was perhaps he, who had already created the role of Demofonte in the first performance of the opera in Rome, who had brought this score to Vienna, among his favorites. The second friend was Luigia Villeneuve, who in a few months would be the first Dorabella. Perhaps in response to a request of this singer, as was customary at the time, Mozart had composed in the first act the great and noble aria Alma grande e nobil core to replace that of Cimarosa. In Mozart’s catalog this appeared as a concert aria (K578), but in this production of the Opéra de Chambre it is possible to hear it in the setting that Mozart had envisioned. Given that in Rome, which was ruled by the Pope, the law forbade women to sing on stage, in the first of the Due Baroni, at the Teatro Valle in 1783, the parts of Sandra and Madam Laura were interpreted by two castrati. The part of Laura, which was especially difficult, was written for Andrea Martini, also known as Senesino, then just 22 years old, who was destined for a brief but extraordinary career in opera seria in all of Europe – one of the last great castrati. Fortunately in Vienna women were authorized to sing! The effect of this Mozartian insert in the world of Cimarosa reveals, initially, a more elaborate music: the orchestra offers two oboes and a bassoon as soloists, and for the occasion, calls in a second bassoon, which was not in Cimarosa���s original score. The initial musical idea is multiplied and divided between the instruments with a complex counterpoint absolutely foreign to the linearity of Neapolitan opera. Around the indignant words of Laura, the musical plans multiply, suddenly opening up a much larger space. It is no coincidence that Mozart gave this music the noblest character, the only character who allows himself a bit of human melancholy. Certainly, a few minutes of beautiful music, limited to a single theatrical situation, are not sufficient to create a human being on the scene. Yet Alma grande provides the opportunity to measure the distance between two languages and two theatrical worlds. Mozart, who loved Cimarosa as he loved all Neapolitan opera, started off from the same instrumental and melodic material as his colleague: the bright sound of the oboe, a melody rendered slightly sinuous by a light chromatic touch. But never in the history of music, did two languages that were are so close serve such totally different purposes. Cimarosa triggers off a puppet play and enjoys driving it crazy. Broadening the musical space around the singer, like a painter who multiplies the shadows and shades, Mozart finds the human being behind the puppets. Cimarosa creates perfect theatrical mechanisms, Mozart populates them with restless men. One can hear the nobility and pride getting to Laura while the musical ideas germinate around her together with the momentum which the orchestra gives to her final invective, in the words but he does not deserve forgiveness, I want revenge. Mozart blends playful beauty into the theatrical and music material provided by the Neapolitan opera, and makes it thrilling. A few months later he wrote Così fan tutte: a geometric theatrical mechanism (indeed, perfectly symmetrical) and as balanced as Cimarosa’s Due Baroni. In the Mozartian laboratory the characters do not go mad; they suffer, are tormented, and see the abyss of their souls, the frailty of men and women beaten by events. When the pressure of deception becomes unbearable and identity crises produce fear, Cimarosa makes his characters escape in a frenzied dance: the keywords in the texts of the Italian buffo finale, as is the case at the end of the first act of Due baroni, are ruin, storm, madness, loss, and fainting. A brilliant way to remove specific choices from the characters and to protect them from excessive suffering in the paradise of theatrical mechanisms: here the subject loses himself, in the whirl of notes and words, in a world of nonsense ruled by the Olympic beauty of a perfectly well-balanced music. When his characters are in the same situation, Mozart seizes the challenge and, prior to entrusting them to an ending that abides by the rules, he accompanies them in the darkness of their inability to decide. At the end of the eighteenth century, two ways of telling a story, of seeing life and the theater, met, melt and confronted each other in Mozart and Cimarosa. Mozart would create a theatre of men troubled by doubts. The last Verdi, Richard Strauss, Britten would follow him. Cimarosa had a profound influence on Rossini, who would enjoy endlessly making his characters flee into the paradise of madness; a genius on the run himself, who took refuge in silence, unable to sustain such a superhuman beauty. From him many estrangements of the twentieth-century theater took flight: the mocking laughter, sometimes cynical, the escapes into another world away from the unbearableness of life. Which would you prefer? In either case you are in for some laughs. In two different ways, Mozart and Cimarosa had understood very well how close laughing and crying were and how the seeming perfect beauty that we see projected on the stage actually hides something far more troubling .